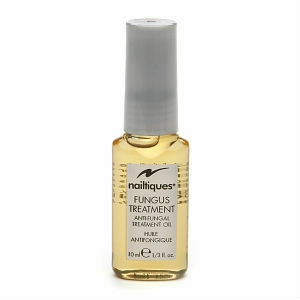 Nailtiques Anti-Fungal Treatment oil is a product which treats common nail fungus infections. Nailtiques is applied with the unique flow-through applicator, and the formula’s blend of oils and fungus-fighting ingredients help kill and stop the spread of germs and bacteria on and under nails. Nailtiques comes in a small 1/3 oz bottle with a silver lid. I was eager to see if Nailtiques Anti-Fungal Treatment was a treatment that worked well; so I looked further to find out more. Polysorbate 20, Caprylic Acid, Camellia Sinensis/Green Tea Leaf Extract, Lactic Acid, Melaleuca Alternifolia/Tea Tree Leaf Oil, Malic Acid, Lauric Acid, Phenylalanine, Rosmarinus Officinalis/ Rosemary Leaf Oil, Salicylic Acid, Citric Acid, Eucalyptus Globulus Leaf Oil, Citrus Grandis/Grapefruit Peel Oil, Aroma, Nicotinic Acid, Tocopherol, Calophyllum Inophyllum Seed Oil, Rosa Canina/Rose Hips Fruit Oil. While I was able to find a long list of ingredients in Nailtiques, I was unable to find a clear explanation about what any of these ingredients do to help nail fungus, which is unfortunate for a buyer looking to understand exactly how a product might work for them. To use Nailtiques you should clean the nail with soap and water and allow it to dry thoroughly. You should then use the flow-through applicator to apply oil on the affected nail and its free edge. This should be repeated twice each day for maximum effect. I was able to find the 1/3 oz bottle on the official Nailtiques website for $22.00. Unfortunately at this time it is unavailable. Many other online retailers matched the price of the official website, however Amazon.com offered Nailtiques for $25.50. I was unable to find any guarantee on the official Nailtiques website. For individual online retailers their money-back guarantees will vary between each place. I was able to find two customer reviews for two different websites. One gave the product a 3/5 star review because they found it unfair to judge a product which took so long to see results. Another review gave Nailtiques 4/5 stars and found it a very good product but that they were currently using their fourth bottle of product, indicating that perhaps Nailtiques does take a long time to work. Nailtiques as a product to kill nail fungus has some positive reviews. Unfortunately for the product it has a poorly explained ingredient list, which makes it hard for buyers to understand how exactly the product works. It also did not include instructions for how long to use Nailtiques; though, from one user’s review who was on their fourth bottle we might assume it is until a healthy nail has grown in, a process which might take around 6 to 9 months. The price of $22 for a 1/3 oz bottle is not especially cheap but nor is it very expensive. Jack Stevens	reviewed Nailtiques	on April 19th	 and gave it a rating of 3.5.